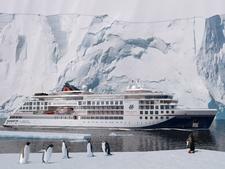 The 28,890-ton, 408-passenger Europa, Hapag-Lloyd's upmarket flagship, primarily serves Europe's German-speaking travelers, but it's also well known to a more global cruise audience. That's because storied guidebook Berlitz has long ranked Europa as its top-rated cruise ship. In fact, Europa's the only vessel in the guide that has consistently merited a five-plus star ranking (every year for more than a decade). While Crystal and SeaDream have attained the highest marks, other luxury cruise lines, such as Regent Seven Seas, Silversea and Seabourn, have never managed to snag the elusive "five-star-plus." Is Europa really the best cruise ship in the world? 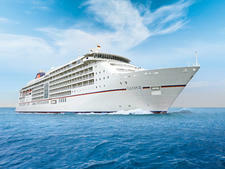 Certainly, in the burgeoning market for German-language cruises, Hapag-Lloyd's luxurious Europa reigns supreme over other Euro-centric lines like AIDA, Mein Schiff, Deilmann's Deutschland and TUI. It's so German that, without the guidebook's recognition, travelers who do not speak the language fluently never would know it existed. To capitalize on that reputation, Hapag-Lloyd has made an effort to reach out to English-speaking passengers -- North Americans, Brits, Australians, South Africans and Kiwis in particular -- by offering specially designated bilingual voyages in which menus, daily programs, some onboard entertainment and enrichment, and a handful of shore excursions are offered in English, as well as German. We tested one of these bilingual cruises -- a Norwegian fjords itinerary with multinational appeal -- yet we were still one of only a few non-German-speaking travelers onboard. Though we were willing to overlook some challenges in adapting to life onboard, we found that socializing can be a challenge, English language shore excursion options are limited, the enrichment program catered primarily to German speakers, and ship rules can be a bit more rigid than you'd experience on Crystal or other luxury lines. Plus, despite separate spaces for smoking and nonsmoking, it was hard to avoid smokers in the indoor lounges. Still, there's a lot to like about Europa. Despite the fact the ship, built in 1999, is considered one of the older vessels in cruising's luxury niche, Europa has undergone three major refurbishments and has been impeccably maintained. Its all-outside, almost all-balcony accommodations are plush and spacious. The ship's itineraries are a sophisticated sightseer's dream; rarely does the vessel repeat an itinerary as it makes its way pretty much around the world each year. Food onboard was consistently superb; the ship's addition of Dieter Muller, a restaurant supervised by Germany's three-star Michelin chef, is one of the best -- perhaps the best -- we've encountered at sea. The enrichment lecturers on this trip, who spoke about Norwegian history and culture, conversed just as easily in English as they did in German, and entertainment -- chiefly as a result of the cruise line's outstanding Ocean Sun Festival, an annual event focusing on classical music and opera that took place on our voyage -- was beautifully arranged. If you're a fan of the genre, it's not to be missed. In other areas, the ship fell short. While Europa is in superb condition, the dated decor feels like a mid-1990's throwback. Bars and lounges are just "blah," and Europa lacks contemporary concepts -- such as more spaces for outdoor living and dining -- that we're seeing on other, newer luxury lines. Entertainment, beyond the specially themed classical festival, was also dated (a DJ in Sansibar, a folk band for special events, big-band dancing, etc.). The biggest disappointment with Europa was that service was hit and miss -- and that had nothing to do with language issues. Standouts included the flawless team at the Dieter Muller restaurant, the maitre 'd at Venezia, who was absolutely charming, and our efficient and intuitive cabin stewardess. In the Beauty Salon and Ocean Spa, the pampering began before your treatment. For us, Europa offered an experience that was a bit of a hybrid between the "old" Crystal -- with its variety of facilities and a la carte pricing on everything, including liquor (which Crystal has since abandoned for a more inclusive experience) -- and the experiences found on Seabourn's three oldest ships, which offer a more intimate and formal cruise ambience. 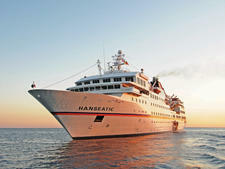 Our bilingual cruise, the second we'd taken on the ship in seven years, was indeed enjoyable, but if Hapag-Lloyd wants to expand its global outreach beyond its traditional customer base and to compete with better-known lines in the luxury sector, it's got some work to do to achieve that accolade. Most passengers hailed from Europa's strong base -- Germany, Austria and Switzerland -- though we met some very pleasant folks from other places, ranging from Hong Kong to Brussels. Even if we didn't really connect with our fellow travelers, we did find them to be unfailingly gracious, and never did we pass folks in the corridor without being offered a courteous "Guten Morgen" (good morning), "Guten Tag" (good day) or "Guten Abend" (good evening). Europa is a very dressy ship, with country-club resortwear favored during the day and three dress codes for nighttime guidance. There's casual-elegant (men are required to wear jackets) and elegant (ties required). On formal nights, tuxedos or dark suits are obligatory for every restaurant aside from the buffet venue. Gratuities are included in all cruise fares. We were told quite firmly that extra tipping is neither necessary nor encouraged, but we noticed some passengers left cash gratuities after dining; additional tips were happily accepted. 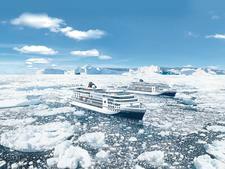 Hapag-Lloyd Cruises, a German line, combines adventure in some of the most far-flung regions of the world with luxury aboard its MS Hanseatic. No question, Europa 2 is one of the most lovely and well-designed ships afloat with contemporary good looks, museum-quality art and chic furnishings. 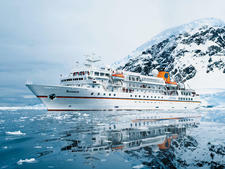 Small and nimble, Hapag-Lloyd's expedition ship Bremen is made for visiting some of the most remote and exotic areas of the world.